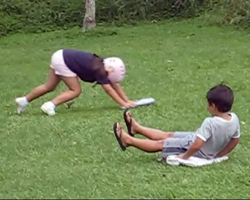 Ice Blocking in Hawaii is Sledding for a Sunny Day. 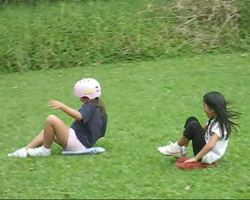 Ice Blocking in Hawaii: Sledding for a Sunny Day! If Phineas and Ferb knew about ice blocking, they might have never created “Swinter” (summer-winter). Nevertheless, those cartoon kids had it exactly right when they decided winter would be a lot more fun if it wasn’t so cold! In case you’re not familiar with that best show on the Disney Channel, Phineas and Ferb live in a perpetual state of summer break – kind of like us here in Hawaii. And on one particularly hot day, they decided to make a mountain of snow using their snow-cone machine. Thus, the whole neighborhood went sledding and skiing in the middle of summer – then everything melted away before their mom came home. Cartoons may exaggerate reality, but Swinter is a fun family adventure activity in Hawaii for any day! We just call it ice blocking; and there’s no snow-cone machine required. 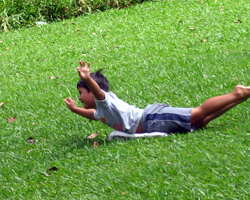 In fact, it’s one of the simplest fun Hawaii things to do. And, honestly, knowing that this picture (left) was taken on January 1 has to make you at least a little bit interested in taking a Hawaii vacation sometime soon. If you have access to a freezer, I’d recommend making your own ice blocks because then you can make them whatever size you want. I make mine in a storage bin that’s big enough to sit on and deep enough to make a block approximately 10 to 12 cm (four or five inches) thick. I even get a little bit of a lip that I can hang onto while sliding. Just keep in mind that something like a sheet cake pan won’t work well because the large surface area and shallow depth will allow the ice to break easily. Furthermore, you’ll definitely want to make more than one block. Between the warmth of the air and damage caused by unseen roots, rocks, and bumps, ice blocking can be very hazardous to the longevity of your ice. 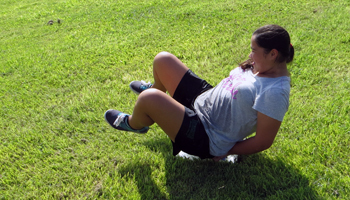 Wear your worst clothes, because they will get muddy and/or grass stained. With that in mind, you might also want to bring a change of clothes and some old towels to clean yourself up before you get on to your next Hawaii attractions. It’s also a good idea to bring some old towels that you can fold up and use as a seat cushion on your ice block. That way it won't melt into your shorts, and you won’t slide off the block. Again, remember that everything you bring is going to be exposed to possible mud and grass stains. Hoomaluhia Botanical Garden campground at 45-680 Luluku Road in Kaneohe, HI 96744. Malaekahana State Recreation Area at 56-020 Kamehameha Highway in Laie, HI 96762. 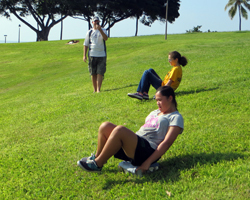 Obviously, any grassy hill with a slope of approximately 30 to 45 degrees will do. And there are many of those scattered about Oahu. If you see one you like, give it a go (assuming it’s not somebody’s private property, of course). All the times that I’ve gone ice blocking, I preferred sliding in a sitting position with my feet up in the air in front of me. 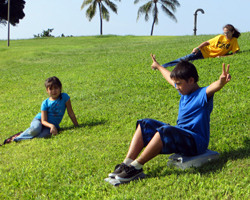 My kids also enjoyed lying down with their bellies on the blocks and then sliding down the hill face first. Either way works fine as long as you don’t drag your hands and feet. That slows you down too much and ruins the fun out-of-control feeling.